Just wanted to share this particular shot. It's a drop of water hanging from an aluminium handle at the front of a barbeque. 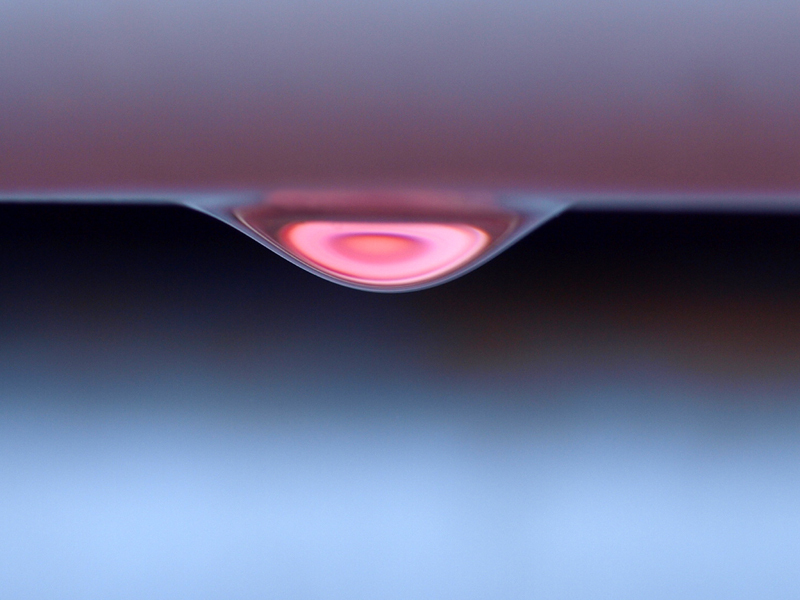 The barbeque has a red lid so the drop has picked up the colour and turned it pink. I think it was just luck that I took it from a good angle. Makes a wonderful abstract ! Thanks Brian! Actually, I couldn't convince a girl at work that it was a real photo. She is still adamant that it's looks so abstract, it must be digitally contrived. Cool, tricks the eye to some extent, to me it looks like a dent in a surface rather than something hanging down! I think it was just luck that I took it from a good angle. Probably not. It's "seeing" the shots that counts. Cool shot, I've got to admit at first I thought it was a digital rendering of some kind. Thanks Harold and Homestar. I must admit I'm a wee bit proud of this photo.